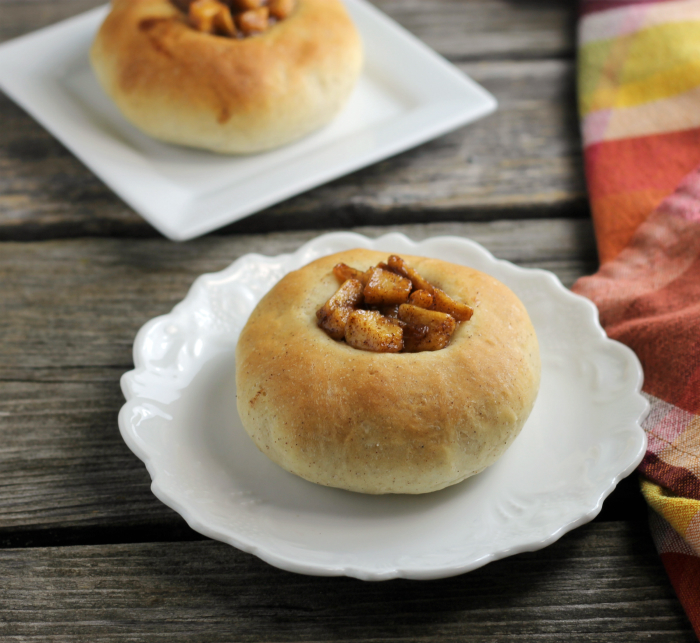 Caramelized Apple topped buns, these buns are tender and moist topped with caramelized apples and then drizzled with a cinnamon icing. Happy Friday everyone. I am so looking forward to the weekend. It should be a weekend with no plans, no rushing, and maybe a little relaxing. How is your weekend shaping up? On to the recipe… This recipe is one that I am really excited to share. 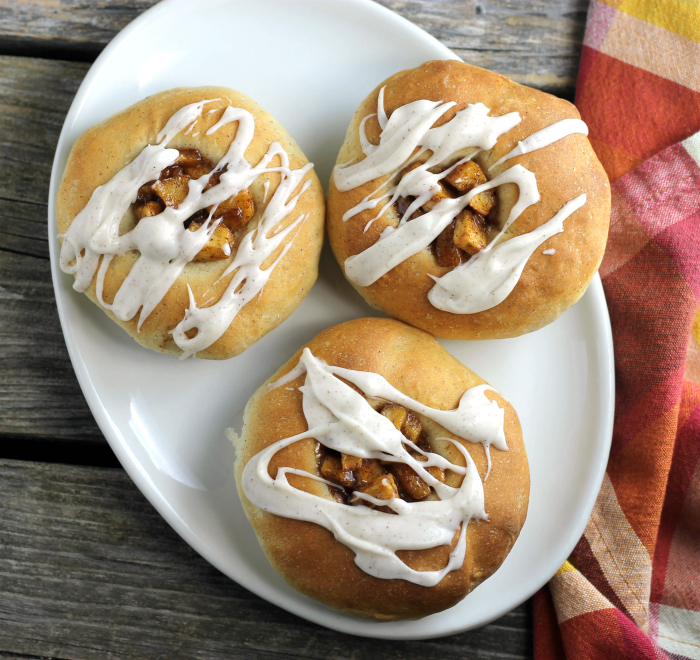 I made these caramelized apple topped buns this past weekend. It was a busy Sunday since we celebrated a couple of birthdays (See my last post). Since I knew that the whole family would be gathered around I decided to make some bread. If you look around this blog you will see that I love to make bread, experimenting with bread recipes, and most of all eating bread. 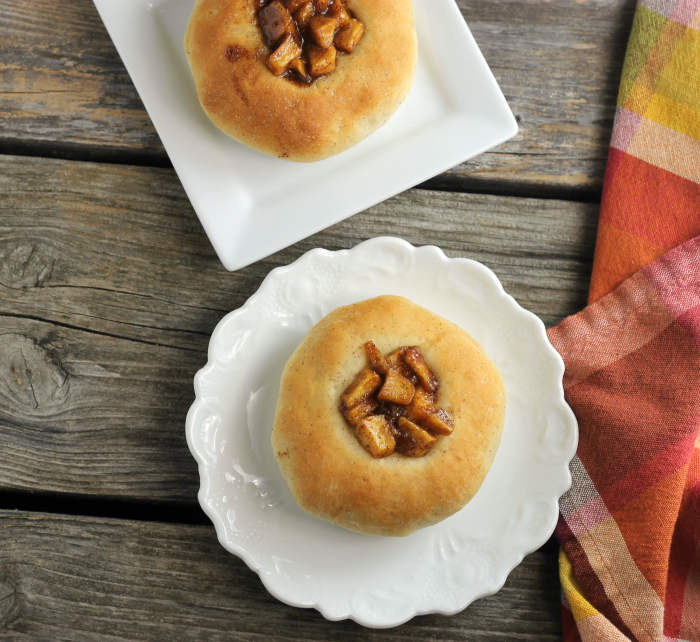 This is one of those recipes I was experimenting with and to tell the truth I could not be happier with these caramelized apple topped buns. The idea for these buns came to me when I was paging through an old cook book that I received from my mom years ago. There is a section in the cookbook that has recipes from different countries. I was looking in the Poland section of the cookbook. I am Polish on my mom’s side. She grew up in a household where they spoke both English and Polish. I love to hear her talk about the recipes that her mother made for them when they were kids. Homemade bread was a recipe that my grandmother made for my mom and her siblings; as well as my mom did for my siblings and I. Well back to the cookbook… there was a recipe for Kolaches. 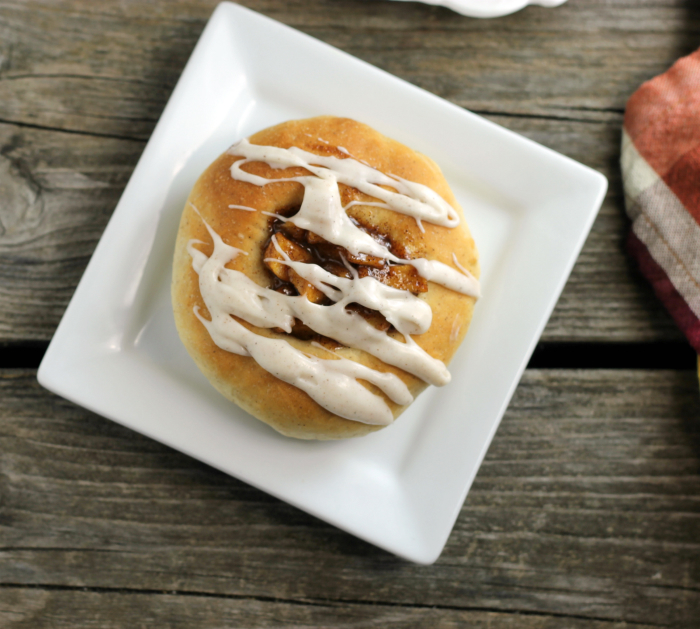 A bun that is topped with a filling. I am not quite sure, but I believe that my mom ate these as a kid. I decided to go with the concept of the filling on top of the bun, but I made the dough and filling that I wanted. By the time that everyone left there was one of these caramelized apple topped buns left; and that was because Mike had set one aside for his lunch the next day. I was able to eat one shortly after they were made. Mike and I were going to share one, but after the first bite I decided I had to keep the whole thing for myself. Tender sweet bread with caramelized apples with cinnamon icing drizzled over top; who could blame me for eating the whole thing? In a large bowl, combine 2 cups flour, yeast, 1/2 cup sugar, salt, and cinnamon. In a microwave save container combine the milk, water, butter, and cream cheese. Heat to 120 to 130 degrees F. Don't worry if the butter and cream cheese don't melt. Add to the flour mixture along with the egg. Mix well with a wooden spoon. Gradually add the rest of the flour until you have a soft dough. Mix this with your hand. Knead the dough until smooth and slightly sticky to your touch. Cover and let rise for an hour or until double in size. In a skillet add the butter, 4 tablespoons of sugar, 1 teaspoon cinnamon, and apples. Cook over medium heat until the apples are softened and caramelized. Set aside. Once the dough is double in size, punch down the dough. Divide the dough into 24 equal parts. Roll each piece of dough and place it on a greased baking sheet. With your hand flatten the ball of dough. Cover and let rise for 1/2 hour. With the tips of your fingers make a well in the middle of each bun. Add a small scoop of caramelized apples. Place the buns in a preheated 375 degree F oven and bake for 12 to 14 minutes or until lightly brownded. Remove from oven and cool completely on a cooling rack. Mix together the 3 cups of powdered sugar and cinnamon. Add enough cream to make the right consistency for drizzling over the cooled buns. If you like this one you make like this. They look really delicious with apple topping! I’m sure glad you came up with this idea! These look and sound great! 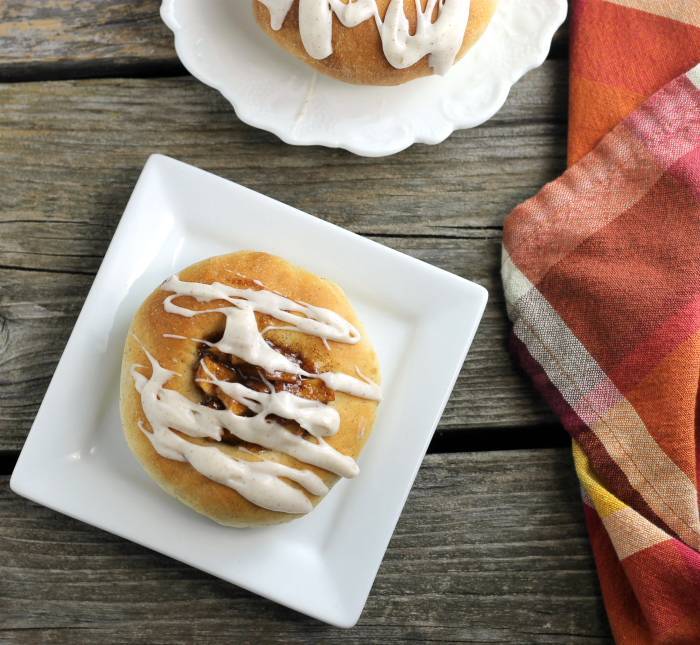 I love a good cinnamon roll, and these totally sounds like a fun twist on cinnamon rolls! Plus, putting the filling on the outside is pretty darned awesome. I can see why you’d want to keep it all to yourself. 🙂 Hope you had a great (and relaxing!) weekend!